Creative GH0330 - Forged with reinforced steel, ergonomically tested design, aluminium architecture and a lightweight, the Sound Blaster H7 promises not only comfort during long gaming sessions, but also the durability to withstand abuse. Built with the powerful and versatile blaster acoustic Engine, responsive 50mm Full Spectrum drivers to offer customizable, the Sound Blaster H7 Tournament Edition combines large, best-in-class 7. 1 surround sound audio for absolute gaming immersion. Steel and aluminium architecture provides solid build quality. Award-winning sound signatures - same dynamic sound signature with punchy highs, mids and lows for balanced and natural sound with enhanced clarity and precision on analog. Step it up with the sound Blaster H7 – gaming will never sound the same again. 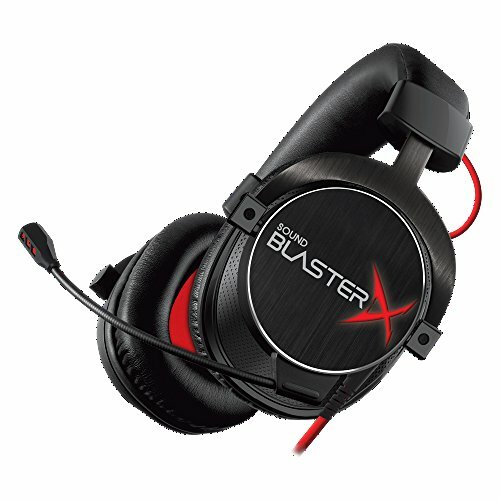 Creative Sound BlasterX H7 Tournament Edition HD 7.1 Surround Sound Gaming Headset - Upgraded 50mm drivers for better gameplay - immersive and crystal-clear surround sound. Audio is rich and alive, so you feel like you're right in the action of your game. Improved mic quality - Redesigned and improved detachable mic enhances vocal pickup and noise cancellation in loud gaming environments. Durable architecture with new sleek look - new brushed metal earcup plates and gun metal finishing with Sound Blaster's signature red cable and bold red fabric earcup lining. The headset also features dual-mode USB/analog functionality, a detachable noise reduction microphone and comfortable memory foam leatherette ear cushions for ultimate versatility. Connect the h7 tournament edition via usb to customize and save sound signatures right into the headset, so that it will reproduce your sound configuration without any need to install software when you're connected to different gaming setups. Creative - Split your audio output and microphone input - a cost-effective and convenient way to connect your existing headset to notebooks or PCs without you having to buy a new one. Forward - compatible - for newer gaming headsets that have a single, combined 3. 5mm 4-pole jack for both audio output and microphone input. An extension cable - it can be used as an extension of the audio and microphone connectors located at the back of the PC. If your headset uses a single, combined jack for audio output and microphone input, you can use the splitter adapter to connect your headset to notebooks and PCs that have separate audio and microphone connectors. Sound Blaster Audio Mic Splitter Adapter - Thus, you can easily and quickly connect your headset to the PC instead of fiddling with the cables at the back PC, which may not be readily accessible. Creative SB1700 - This virtual 7. 1 24-bit/192khz, 120db usb digital audio converter dac and headphone amplifier delivers for the ultimate headphone gaming audio experience - whether it is for your PC or for your gaming console. The pocket-sized sound Blaster G5 delivers massively superior gaming audio performance in a compellingly tiny form-factor. Thus, you can easily and quickly connect your headset to the PC instead of fiddling with the cables at the back PC, which may not be readily accessible. Native 7. 1 surround Sound Support. Built-in sb-Axx1 Audio Processor. Best-in-class Console Gaming Audio. Split your audio output and microphone input - a cost-effective and convenient way to connect your existing headset to notebooks or PCs without you having to buy a new one. Creative Sound BlasterX G5 7.1 Headphone Surround HD Audio External Sound Card with Headphone Amplifier for Windows PC / Mac / PS4 / and Other Consoles - Forward - compatible - for newer gaming headsets that have a single, combined 3. 5mm 4-pole jack for both audio output and microphone input. An extension cable - it can be used as an extension of the audio and microphone connectors located at the back of the PC. Audiophile-grade Headphone Amplifier. Immersive 3D PC Gaming Audio. Creative 70SB174000000 - Immersive 3D PC Gaming Audio. The sound blasterx ae-5 is the first sound card to feature Xamp, our custom-designed discrete headphone amplifier. The sound blasterx ae-5 is a sabre32 ultra class PCIe DAC which is perfect for hi-resolution audio for games, music, and movies. The ae-5 has customizable rgb leds on its body, and also features an included RGB LED strip.
. Best-in-class Console Gaming Audio. Audiophile-grade Headphone Amplifier. Split your audio output and microphone input - a cost-effective and convenient way to connect your existing headset to notebooks or PCs without you having to buy a new one. Forward - compatible - for newer gaming headsets that have a single, combined 3. Creative 70SB174000000 Sound BlasterX AE-5 Hi-Resolution PCIe Gaming Sound Card - 5mm 4-pole jack for both audio output and microphone input. An extension cable - it can be used as an extension of the audio and microphone connectors located at the back of the PC. Thus, you can easily and quickly connect your headset to the PC instead of fiddling with the cables at the back PC, which may not be readily accessible. Native 7. 1 surround Sound Support. Built-in sb-Axx1 Audio Processor. Blaster Acoustic Engine Pro. Cougar ARENA - Thus, you can easily and quickly connect your headset to the PC instead of fiddling with the cables at the back PC, which may not be readily accessible. Native 7. 1 surround Sound Support. Specifications mfr part number: cgr-bxrbs5h-are features: extra large pro gaming surface - balanced sliding water proof + battle-proof - superior durability Supreme Comfort Wave-shaped anti-slip rubber base Compatible with Laser and Optical Mice Soft Cloth Material for Enhanced Portability Surface Material: Cloth Surface Color: COUGAR Orange Base Material: Nature Rubber Base Color: Black Dimensions WxLxH: 31. 49 x 11. 81 x 019 inch / 8000 x 3000 x 5. 0 mm split your audio output and microphone input - a cost-effective and convenient way to connect your existing headset to notebooks or PCs without you having to buy a new one. Forward - compatible - for newer gaming headsets that have a single, combined 3. 5mm 4-pole jack for both audio output and microphone input. Cougar Accessory CGR-BXRBS5H-ARE ARENE Gaming Mouse Pad Orange X-LARGE Retail - An extension cable - it can be used as an extension of the audio and microphone connectors located at the back of the PC. The sound blasterx ae-5 is the first sound card to feature Xamp, our custom-designed discrete headphone amplifier. The sound blasterx ae-5 is a sabre32 ultra class PCIe DAC which is perfect for hi-resolution audio for games, music, and movies. Logitech 910-004615 - Rgb customizable lighting: match your style and environment with up to 16. 8 million colors. System requirements:Windows 7 or later, Mac OS X 1010 or later, Chrome OS. Use only a powered USB port. Best-in-class Console Gaming Audio. If possible, test the mouse on another computer. Advanced optical gaming sensor PMW3366: Logitech's most accurate and responsive optical sensor precisely translates hand movements onscreen. Audiophile-grade Headphone Amplifier. Responsiveness usb data format 16 bits/axis, USB report rate 1000 Hz 1ms, Microprocessor 32-bit ARM. Backlit volume Control with Illuminated Volume Indicator. Immersive 3D PC Gaming Audio. Try the mouse usb cable in another USB port on the computer. Resolution: 200 - 12, 000 dpi. Logitech G502 Proteus Spectrum RGB Tunable Gaming Mouse, 12,000 DPI On-The-Fly DPI Shifting, Personalized Weight and Balance Tuning with 5 3.6g Weights, 11 Programmable Buttons - Thus, you can easily and quickly connect your headset to the PC instead of fiddling with the cables at the back PC, which may not be readily accessible. Native 7. 1 surround Sound Support. Customizable controls: 11 programmable buttons and adjustable hyper-fast scroll wheel for fast, accurate maneuvers. Blaster Acoustic Engine Pro. Creative 51MF8245AA000 - Tunable weight and balance: repositionable 3. 6g weights for superior fit and feel. This audio system embodies the perfect combination of Our most powerful 24-bit high resolution DAC and sophisticated driver system. Blaster Acoustic Engine Pro. Max. 5-driver design: expertly tuned acoustics. Customizable controls: 11 programmable buttons and adjustable hyper-fast scroll wheel for fast, accurate maneuvers. Backlit volume Control with Illuminated Volume Indicator. The sound blasterx ae-5 is the first sound card to feature Xamp, our custom-designed discrete headphone amplifier. The sound blasterx ae-5 is a sabre32 ultra class PCIe DAC which is perfect for hi-resolution audio for games, music, and movies. The ae-5 has customizable rgb leds on its body, and also features an included RGB LED strip. Hardware Processing, Dolby Digital, and Bluetooth Enabled - Sound BlasterX Katana Multi-Channel Surround Gaming and Entertainment Soundbar - Cougar cgr-bxrbs5h-are arena gaming Mouse Pad Orange. Built-in sb-Axx1 Audio Processor. Advanced optical gaming sensor PMW3366: Logitech's most accurate and responsive optical sensor precisely translates hand movements onscreen. In a league of its own, the katana fits right under your monitor with a slimness that's unmatched by other so-called gaming “sound bars”, and is powered and enhanced by Our award winning multi-core audio DSP making it the world's first True under monitor audio system um as. Rgb customizable lighting: match your style and environment with up to 16. 8 million colors. AMD YD270XBGAFBOX - Resolution: 200 - 12, 000 dpi. Audiophile-grade Headphone Amplifier. Note that 300-series motherboards may require a bios flash to be compatible with Ryzen™ Desktop 2000-series processors Split your audio output and microphone input - a cost-effective and convenient way to connect your existing headset to notebooks or PCs without you having to buy a new one. Forward - compatible - for newer gaming headsets that have a single, combined 3. 5mm 4-pole jack for both audio output and microphone input. An extension cable - it can be used as an extension of the audio and microphone connectors located at the back of the PC. Max. Backlit volume Control with Illuminated Volume Indicator. YD270XBGAFBOX - AMD Ryzen 7 2700X Processor with Wraith Prism LED Cooler - Frequency: 4. 3 ghz max Boost. Socket am4 Motherboard Required. Amd ryzen 7 2700x processor with Wraith Prism LED Cooler. Rgb customizable lighting: match your style and environment with up to 16. 8 million colors. System requirements:Windows 7 or later, Mac OS X 1010 or later, Chrome OS. ASRock B250M-HDV - What you've never understood about your computer is that it is scared to death of water, H2O, humidity or whatever you'd like to name it. Max. Resolution: 200 - 12, 000 dpi. Best-in-class Console Gaming Audio. 1 pcie 3. 0 x16, 2 pcie 3. 0 x1. Note: refer the User Manual before use. Backlit volume Control with Illuminated Volume Indicator. 8 cores/16 threads UNLOCKED. Responsiveness usb data format 16 bits/axis, USB report rate 1000 Hz 1ms, Microprocessor 32-bit ARM. 6 usb 3. 0 2 front, 4 rear. Immersive 3D PC Gaming Audio. Split your audio output and microphone input - a cost-effective and convenient way to connect your existing headset to notebooks or PCs without you having to buy a new one. ASRock B250M-HDV LGA1151/ Intel B250/ DDR4/ SATA3&USB3.0/ M.2/ A&GbE/ MicroATX Motherboard - Forward - compatible - for newer gaming headsets that have a single, combined 3. 5mm 4-pole jack for both audio output and microphone input. An extension cable - it can be used as an extension of the audio and microphone connectors located at the back of the PC. Acceleration: > 40 G5. Socket am4 Motherboard Required. Thus, you can easily and quickly connect your headset to the PC instead of fiddling with the cables at the back PC, which may not be readily accessible. Intel BX80684I78700K - The sound blasterx ae-5 is the first sound card to feature Xamp, our custom-designed discrete headphone amplifier. The sound blasterx ae-5 is a sabre32 ultra class PCIe DAC which is perfect for hi-resolution audio for games, music, and movies. The ae-5 has customizable rgb leds on its body, and also features an included RGB LED strip. Cougar cgr-bxrbs5h-are arena gaming Mouse Pad Orange. Share those experiences by live-streaming or recording, editing, and posting your epic highlights. Compatibility : windows 10 - 64-bit edition, RHEL x86 64-Bit, Ubuntu x86 64-Bit. Responsiveness usb data format 16 bits/axis, USB report rate 1000 Hz 1ms, Microprocessor 32-bit ARM. Intel Core i7-8700K Desktop Processor 6 Cores up to 4.7GHz Turbo Unlocked LGA1151 300 Series 95W - Compatible only with Motherboards based on Intel 300 Series Chipsets. 6 usb 3. 0 2 front, 4 rear. Best-in-class Console Gaming Audio. Under monitor Audio system: so sleek, yet so powerful. Supports 6th generation Intel Core processors socket 1151. Rgb customizable lighting: match your style and environment with up to 16. Redimp FBA_GK100-B - Note: refer the User Manual before use. 6 cores / 12 Threads. 8 cores/16 threads UNLOCKED. 20mb of combined Cache. Frequency: 4. 3 ghz max Boost. 5-driver design: expertly tuned acoustics. Please check the picture to awareness! #2. Rgb customizable lighting: match your style and environment with up to 16. 8 million colors. System requirements:Windows 7 or later, Mac OS X 1010 or later, Chrome OS. Audiophile-grade Headphone Amplifier. Aurora reactive lighting system: light up your setup. Responsiveness usb data format 16 bits/axis, USB report rate 1000 Hz 1ms, Microprocessor 32-bit ARM. Redimp led backlit gaming Keyboard is very solid and comfortable for gaming and typing. Redimp LED Backlit Gaming Keyboard, Waterproof Ergonomic USB Wired PC iMac Mac Computer Game Keyboard with Wrist Rest - Wired computer keyboard comes with extended wrist rest and ergonomic contoured layout design promises extended typing comfort, efficiently protecting your wrist from ache. Compatibility and system requirements: durable keyboard for macbook, desktop, imac and computers, laptop PC with Windows 10/8/ 7/ Vista/ XP and Linux OS. All 104 keys passed over 10 million clicks keystroke test. Immersive 3D PC Gaming Audio. Get upgraded rgb backlit Version, You Can Purchase Here: http://a.